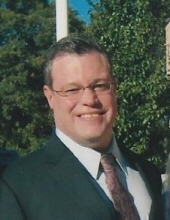 BILLERICA – Robert J. Beland, age 56, husband of Regina (Fonseca) Beland died Friday at Lahey Hospital and Medical Center in Burlington. He was born in Methuen, April 27, 1962 a son of the late George and Joan (Boudreau) Beland and lived in Amesbury before moving to Billerica. Bob served in the US Air Force from 1980 – 2000 in Bioenvironmental Engineering attaining the ranks of TSGT. He was referred to as “Bio Bob” during his career. More recently he worked in Information Technology at the E. N. Rogers VA Medical Center in Bedford. Besides his wife he is survived by his best friends, whom he considered his brothers, Steven Roy and his wife Heather and Kevin Roy as well as his friend Kathy Larsen. A Memorial Service will be held Saturday at the E. N. Rogers VA Medical Center Chapel, Springs Rd. Bedford at 10 a.m. Relatives and friends respectfully invited. "Email Address" would like to share the life celebration of Robert J. Beland. Click on the "link" to go to share a favorite memory or leave a condolence message for the family.